actually staying will result in loss of all deposits and immediate eviction. up to one year from the original check-in date (subject to availability). eliminate all smoke residuals may also be charged. be charged if a mattress needs to be replaced due to guest negligence. There were two couples on this particular trip, and upon arrival we were amazed at the beautiful lanai ocean views. The condo was very spacious and roomy with the vaulted ceilings and large bedroom. As cooks, we found the kitchen to be very well supplied and stocked with all the utensils we could ask for. (Note: wine opener needs to be replaced as it did not work). The Kanaloa grounds were immaculate, the pools very clean and the closeness to a KTA grocery store very useful. We loved the South Kona area and it's low key vibe and green lushness! We would definitely stay again in Condo 3104 at Kanaloa. As a side note: We did not see a sleep number bed which we were excited to try, as its a bed we are considering in our own home. However, the beds were very comfortable and the stay was a perfect "10" on the Big Island. this is an upstairs unit with carpeted stairs from the landing to the main living area. We had a lovely time while staying at this property. I really enjoyed waking up to the ocean every morning and seeing all kinds of dolphins and even a few whales! The kitchen was super well equipped which is a bonus because we love to cook. If I’m ever back I would definitely stay here again! This condo is beautifully appointed and has spectacular views as it is an upstairs condo. We enjoyed eating on the lanai where we also watched whales, spinner dolphins and the world go by. The owners have equipped the condo with all the extras: beach gear for just enjoying or snorkeling; information of places to visit or eat; condiments in the frig and spices in the cupboard are helpful when only spending a week or two; and a full size washer and dryer are welcome so you don't have to hang things out to dry. Our three generational family of five loved the accommodations. It is near enough to walk for groceries, the Farmer's Market, or casual dinners at the Keauhou Shopping Center. There are several golf courses to enjoy as well. We would welcome the opportunity to stay here again. Thank you very much for letting me know. I will have it taken care of. I am glad you enjoyed your stay. My wife and I stayed here to celebrate our wedding anniversary. We thoroughly enjoyed the views from 3104 and the tranquility next to the ocean. It was also a bonus to be close to Kailua-Kona for supplies or groceries. This is a nice place to stay if you don't need to contact the owner for any reason. We stayed for nine days in December and were told the A/C fee was optional but were charged for it anyway. I tried three times to contact the owner with no response. There were also some maintenance issues in the master bathroom including a VERY loud squealing from the pipes at all hours of the day (including night) that could be heard in the adjacent bedroom. Otherwise our stay was comfortable and the complex is in a nice peaceful area away from the hustle and bustle of Kona. I would return to this area but would probably choose a different unit next time with a more responsive owner. I am sorry for missed connections as far as communications. I have refunded the fee for the air conditioning and have spoken to the guest about a few maintenance concerns. All are being addressed at this time. What a perfect place for a great vacation. This place has everything. From the beautiful ocean view for a morning coffee with the dolphins to all the beach toys you would need during your stay. It is great. Fantastic bed rooms, everything is roomy, clean and new. All the little touches are there to make you feel at home. You are truly a valued guest. Very different from some other rentals where things have not been updated. We will definitely be back! Beautiful Place to Enjoy the Island! The place was clean, well equipped and beautiful. It was so fantastic to have everything you needed for beach at the condo to use. We just left everything in our vehicle for our daily beach trip. The pools were amazing, and we spent a lot of time on the lanai listening to the ocean and watching the sunset – we made sure we were back every night in time. It is close to Kona (about 10-15 minutes) and a grocery store (3 minutes). Very quiet and relaxing complex. The only negative I have is the smoking area. The designated area is by the gate with a bench, but no cover or ashtray. It isn’t close to the unit, so it made for a lot of walking, which wasn’t fun when it was pouring rain. If you have a smoker in your group I would rethink anything in this complex (there were smokers from other units that weren’t impressed either). Condo was thoroughly provisioned and very comfortable. Love the closeness to ocean. Would definitely stay again. Wonderful condo on the ocean! We stayed at condo 3104, and were very pleased with it. Everything needed was supplied, including coolers, snorkeling gear, beach towels and beach chairs. It was very close to the town of Kona and was still secluded enough to not be bothered by city noise. The 3 pools were never crowded and the security gate personnel were very friendly. The condo is very pretty, the beds were very comfortable, the kitchen was well stocked. The owner responded quickly when we informed her of a broken toaster, and a new one was waiting when we came back from a day of touring. The best part was the magnificent view from the lanai. We enjoyed sitting out there watching the outriggers, night manta Ray tour boats and we even were lucky to see several whales! I would recommend this condo to anyone looking for a great place to stay!! Pictures don’t do the view justice! Beautiful place!Every detail has been taken care of to make a perfect condo.... furniture high end, comfortable mattresses, great sheets- felt like home right away!Extremely clean- I’m pretty picky so that compliment doesn’t come easy :)Will stay here again for sure! We had a wonderful stay in Kona! The Condo was perfect for our Family, nice large rooms with a great kitchen area for cooking. The view from the lanai was spectacular, we got to see dolphins several times and on our last morning we even saw a whale not far from shore.This was our first time staying in Kona and we will definitely be back. Everything you want to do on the island is easily accessible from here.The owner, Mhari was so nice and we enjoyed dealing with her. The staff at the condo complex were very friendly and helpful when we needed anything.The pool areas were great, we spent several afternoons at the Oceanside pool, just beautiful! Thanks so much, hope to back! The condos at Kanaloa are beautiful. Wonderful, spacious, well-equipped units on a lovely landscaped property, right on the ocean. We loved our stay last week. The location was perfect for us, as we enjoyed the quiet of the compound, but it was an easy drive into the busy town of Kona. The pool areas are lovely, and you have the choice of one with an ocean view or one with a garden-like setting. We enjoyed both. It was really nice to have things like dishwash tabs, laundry powder, and coffee filters available as well. I highly recommend Condo 3104. We were more than happy with unit 3104! Clean, comfortable, superb location overlooking both pool and ocean. We were lulled to sleep every night to the sound of crashing waves. Owner thought of everything - beach chairs, cooler, boogie boards and beach umbrellas - all the things you would have to go out and buy to really enjoy your stay. Beautifully landscaped and maintained pool area and BBQ outdoor kitchen and dining area! Hope to return soon. The home was spotless and perfect for our vacation. The house is well-stocked with appliances, linens, tableware and beach toys. We spent several days golfing at Kona and Mauna Lani and took an all-day Twilight Volcano trip with Wasabi Tours where we saw the volcano dramatically erupting over the rim. Spectacle against the night sky was amazing. Thank you for sharing this lovely home with us. The condo and the situation are exceptionnal ! We stay theire for 2 weeks and it was beautifull ! It's possible to see dolphins during your breakfast and the the sunsets are incredible ! Hope to be back on other time. After visiting Kona for the first time with my family, I just have one thing to say; this only way stay while visiting Hawaii period. I consider this the GOLDstandard of living while vacationing in Kona. As far as I'm concerned if I ever visit Kona again my hope is to stay at Condo 3104 again. Thank you for allowing us to share your home and hope to do it again. My family had a great time. The view was great, the condo was fair. You can't beat a 180 degree ocean front view in Hawaii, but, the accommodations were outdated and threadbare and not worth the price. The carpet was stained, the sheets and towels had many holes in them, the shower was backed up from day one, and we were not provided enough toilet paper. Simple items usually provided were of very low quality or non existent. The first night there, I had a huge cockroach crawl across my pillow and over my body. For the amount I spent, this should not have happened. The beds were comfortable though, and the view was great. I have stayed in a number of condos in this complex, and this one was not worth the view, or the price. The place was great. We will be booking it next year again. Our family of six, including three generations, stayed at this wonderful condo for the first week in June. Everything was as described but better. We felt like we had a home away from home. We especially enjoyed sitting on the lanai, watching and listening to the waves. We had plenty of room, comfortable beds, and a great location. There were beach chairs, toys, bag, and umbrella and many other extras. The condo and grounds were so beautiful. We were in a convenient location for grocery shopping and sightseeing especially the Fairwind morning snorkle and b b que. Our family of first time snorklelers had an amazing time and highly recommend this experience. Our stay at this condo helped make this a dream vacation for our whole family. We had a fabulous time in your condos. They were very comfortable, clean and convenient to the places we wanted to go. Condo 3104 was perfect for our 2 week stay!! Lovely decor and well appointed with everything you need. There were binoculars to watch the dolphins pass by, a couple of sets of snorkel and fins, boogie board, noodles, tennis rackets and balls, The kitchen was well stocked with every appliance and gadget needed. Beds were ultra comfortable and lots of towels. We loved watching the spectacular sunset from the lanai where we enjoyed all our meals. We definitely recommend this condo, you will not be disappointed! Thank you for sharing this wonderful space!! What a beautifully furnished and well stocked home! This condo had everything we needed and more! The best part was the unbelievable sunset and view from the large lanai! I would definitely go back! We spent a week at this nice condo. Great ocean views, whale watching and pleasant surroundings. The place is very well appointed and well maintained. I would recommend it without a second thought. I am hesitant to make a comment here, because I don't want to share this amazing secret. We have stayed in the Kanaloa condos for many years and the ocean front condos are wonderful. This particular unit, 3104 is our favorite. Mornings on the lanai drinking coffee, eating papaya and oatmeal... watching the waves, and seeing dolphins and whales... It doesn't get much better than this. We spend our days out exploring this amazing island and the beautiful beaches. We look forward to our evenings on the lanai watching the sunset and having pupus, then dinner after the sun goes down. This condo has everything you might need. A fantastic stay in a beautifully-appointed condo, equipped with everything needed for a relaxing retreat. Many thanks. We visited in mid December 2016. Everything was great! The condo is nicely updated and very comfortable. The view is worth every $. Every morning we had coffee on the lanai, the first 2 days we saw Whales! The complex is very quiet and relaxing. There are beach chairs, coolers, a beach umbrella, boggie boards and even sand toys for the kids. Last year in December when we visited it was humid and sticky at night and the a/c was a must. This year was cooler and the unit has ceiling fans as well as newer tower fans to keep you comfortable.Kanaloa is about 2 blocks from grocery store and Longs Drugs but you would need a car to get to Kona. Covered parking close to the unit. The spots are a litte small so don't get a big car and expect to easily park :-).This is our second stay at Kanaloa at Kona and we would highly recommend 3104! Thank you Mhari! There were two couples on this particular trip, and upon arrival we were amazed at the beautiful lanai ocean views. The condo was very spacious and roomy with the vaulted ceilings and large bedroom. As cooks, we found the kitchen to be very well supplied and stocked with all the utensils we could ask for. (Note: wine opener needs to be replaced as it did not work).The Kanaloa grounds were immaculate, the pools very clean and the closeness to a KTA grocery store very useful. We loved the South Kona area and it's low key vibe and green lushness!We would definitely stay again in Condo 3104 at Kanaloa. As a side note: We did not see a sleep number bed which we were excited to try, as its a bed we are considering in our own home. However, the beds were very comfortable and the stay was a perfect "10" on the Big Island. Very comfortable and conveniently located. The lanai is worth every penny. A great home away from home. Great Stay at Kanlaloa Condos!! We highly recommend this condo for it's nice location, size, and A/C. The place is very well appointed, and the back deck very relaxing. The condo was the perfect place for a family to stay. The rooms and beds were comfortable and the home was equipped with every amenity you could need! From fans, to kitchen supplies, extra beach towels, snorkel gear, and beach/pool toys. Overall, it was a convenient and lovely location. The balcony was a wonderful spot to eat and watch the sunset. There was a bbq a short distance away. We had family staying at another resort 5 min away, so we used their pool, but the resort grounds were beautiful and well kept. Wechose to stay 4 nights here bc of its central location to other parts of island for activities and 4 nights on the Kohala Coast to take advantage of a sandy, swimmable beach. It is possible to snorkel directly out from the rocks in front of the condo, but not for young kids. I definitely recommend this property/unit and would come back again! We felt instantly at home and very comfortable. We were on the beautiful island of Hawaii for my granddaughter's wedding at the Mauna Kea Beach Hotel. We selected Kanaloa at Kona, Condo 3104, for the beautiful view from the lanai, the roominess of the condo and the decor. This condo exceeded all our expectations! In addition to the above, it was well stocked with everything we needed. In the evening we were able to sit on the lanai and watch the beautiful sunsets while listening to the surf. Absolutely beautiful! If we return to the island, we will definitely stay here.Thank you Mhari for allowing us to stay in your beautiful condo. Read the reviews - they are all full of praise. This condo and the complex are fantastic. You cannot go wrong when choosing to stay here. Every detail the other reviewers give is accurate. I love, love, love this location. We stayed in the condo for 10 days and were very satisfied. The condo was clean. The kitchen was well equipped and the furniture was of good quality and tastefully selected. The beds were very comfortable and the sleep quality really good. We enjoyed having breakfast on the lanai, which is directly in front oft he ocean. All in all we can really recommend this apartment. Wonderful place to stay for our family. We had a wonderful time staying in Condo 3104 and at the Kanaloa at Kona complex. We were traveling with another family that also stayed in the complex in another unit. Condo 3104 was perfect. Well-appointed and very well-cared-for. The owners were very helpful and thought of it all in terms of what was provided in the condo including kitchen equipment, beach towels, tennis rackets (our family played tennis most mornings), boogie boards, snorkeling equipment, and washer/dryer (we generate a lot of laundry and it was nice to come home with clean clothes), etc.. The view from the lanai was spectacular. The grounds were immaculately maintained. The ocean pool became a congregating place after a day at the beach or for a day off from hiking and snorkeling activities. The location is very convenient as a home base for exploring the island, including convenient for quickly getting to local establishments for dinner or picking up groceries or take out. Truly an enjoyable, relaxing, convenient and magical place. We are thankful for having spent time here. Starting with the location of the development, it is away from the string of Comdo's on Alii Drive and yet close to 15 minutes from town. It is walking distance to a shopping center with a KTA, several restaurants, a Longs (they did not change the name here!) and a movie theatre. Not to mention an fabulous Saturday morning Farmer's Market. There is also a Wednesday morning Farmer's Market just a few blocks the other direction. The develop,entitled self Kanaloa is well designed and impeccably kept. It has a feeling of being in a village as opposed to an apartment complex. 3104 is situated on the water with to live for views and striking sunsets. If there are whales you will see them! It is far away enough from the pool that you don't get the noise and close enough that it is quite convenient. It has been remodeled beautifully and the kitchen is well stocked (important for me). The furniture is comfortable (novel concept), the bathrooms are beautiful and functional. The laundry is convienent with full size new Maytags. They have an ice chest and some pool and beach stuff. The great news about being on the second story is great views and the bad news for my old body is the light of stairs. This unit also offers a covered parking spot, where as many have their own cars in that spot and you have to leave your car in the hot sun. Great part of Kona, great complex and great unit. Highly recomended. If ocean views are your thing, this is the place! We have stayed on the Big Island many times, and Kanaloa at Kona is hands down our absolute favorite place to stay. This condo is amazing in every way; views, decor, cleanliness, layout and everything you could possibly need for your vacation! The complex is beautiful and with tennis courts, 3 pools, barbecues, and club house - you don't really feel inclined to leave and explore the island. It was easy to make the reservation, get into the condo, and check out. We'll definitely be back! 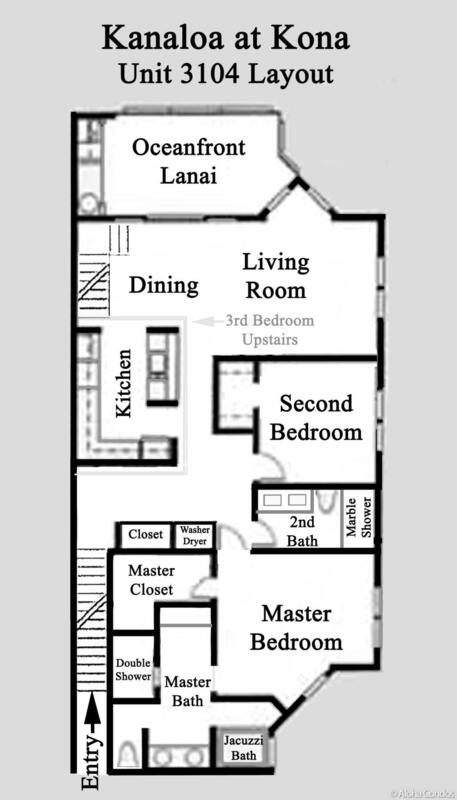 We rented #3104 at Kanaloa at Kona for a 2 week stay in January 2015 and had a wonderful time. We booked through Aloha Condos which was really easy. Grandparents, parents and the 7 year old all agreed it has been our best condo yet. The lanai was huge and covered which meant we spent hours sitting out on it watching outrigger canoes, rainbows, whales and dolphins. There was also enough space indoors that it was easy to find an area to sit and quietly read without being disturbed. The condo was quiet being the top floor and was well outfitted - boogie boards, snorkeling equipment, coolers, kitchen gadgets, books, etc. Even the resort was nice and quiet, we often had the main pool to ourselves and spent many hours swimming. The grounds are well taken care of and staff was always friendly. Kanaloa at Kona is located in a great area, it was easy to get to the highway for our many adventures and was off Ali'i drive with it's crazy traffic. We really enjoyed our time at the resort, especially at #3104. I sure hope to go back! My wife and I traveled with our teens to the Big Island for the first time. This condo is in a beautiful location, on the ocean. VERY clean, well maintained and has everything you need from beach towels, boogie boards, coolers to a fully stocked kitchen. Morning breakfast on the lanai in this peaceful location is a perfect way to start the day...we were even greeted with a whale jumping out of the water our first day. Don't miss sunsets either. Awesome step away from reality! We enjoyed very much our eight days in #3104. The condo was comfortable, provided all that we needed, perfectly located and, yes, we hope to return. This was our 8th stay in Kanaloa. It is the best: pools, quiet, friendly service people, well located for walks and runs, markets, snorkeling - oh, why did we leave! Ocean front condo 3104 is a great place to spend a relaxing vacation with a gorgeous view of the ocean. The condo unit is very clean and has all the amenities you will need and more. Everything from a washer & dryer, lots of cookware, beach towels, chairs, snorkels and fins. The lanai is a great place relax, listen to the waves, watch whales and enjoy a cold beverage. The compound itself it quiet and well-kept. The pools are nice and kept clean. The people who work there are very nice and helpful whenever you need it. Great place to stay!